When the Dolphins drafted wide receiver Brian Hartline in the fourth round of April's NFL Draft they not only added size and speed to their receiving corps, but they also reunited two Ohio State Buckeyes in the process. Third-year wideout Ted Ginn, Jr., who competed against Hartline in high school track and football up in Ohio, had been the only former Ohio State player wearing Miami's aqua and orange and had to stare down second-year quarterback Chad Henne and second-year left tackle Jake Long by himself last year when the two former Michigan Wolverines were rookies. Now he has another Ohio State alum in Hartline to keep him company - and he also has a familiar face running pass patterns with him during practice. The 22-year-old Hartline is about three inches taller than Ginn at 6-feet-2 inches and a little heavier at 186 pounds compared to Ginn's 180, and while he would be hard pressed to cross the finish line ahead of Ginn in a foot race, he can get behind many a defensive back. At Glen Oak High School in North Canton, Ohio, Hartline captured state titles in the 110-meter and 300-meter hurdles as a senior and used that speed to his advantage as a two-year starter for the Buckeyes before opting to leave school early and declare for the draft. His study habits and athleticism left a lasting impression on the Dolphins receiver he no doubt will most often be compared to – Greg Camarillo – during OTAs and the three-day mini-camp held in the middle of June. "He's faster than me and he makes some big plays, he's definitely a skilled receiver and I'm excited to see what he can do for us this year," said Camarillo, who is entering his fourth season and coming back from a torn ACL that cut short his 2008 campaign. "He's a smart guy. He picks up everything real quickly and I think he knows that if he asks questions he can learn a lot faster." Hartline has leaned on Ginn more for the off-the-field stuff as he transitions to life as a professional football player since Ginn went through it under a bigger microscope as the ninth overall pick of the 2007 NFL Draft. During the short time he was on the same field and in the same locker room and weight room as the veterans, Hartline stayed close to Camarillo and listened intently to receivers coach Karl Dorrell. Some of Hartline's most beneficial lessons, however, came inside the practice bubble away from the rest of the team when veteran quarterback Chad Pennington put in some extra work with the receivers. This is something Pennington has done throughout his career, not only with the receivers but with the offensive line as well, and for rookies like Hartline and Patrick Turner, the third-round pick out of USC, these sessions are invaluable. "I love playing for him. I think he's a guy that's very meticulous and knows what he wants out of his receivers," Hartline said. "Again he's a veteran so he can kind of give you some ideas about running some routes and even kind of coach you up because he's seen so much of it. So to me that's a definite plus playing with Pennington and also playing with Henne." Prior to his freshman year in high school, Henne played running back and linebacker and has talked about how that background helped him and still helps him on the field because he is aware of the linebackers' tendencies in the passing game and can appreciate how the running backs react as receivers. For Hartline, he can relate – but in reverse as he started out as a quarterback his junior year in high school before switching to wide receiver midway though the season. Michael Hartline is Brian's younger brother and he evolved at the quarterback position to the point where he is currently the starting quarterback at the University of Kentucky, but Brian credits his experience as a quarterback along with his overall athleticism (he also played baseball and basketball in addition to football and track and field) with preparing him to succeed as a receiver. Head Coach Tony Sparano has liked what he has seen to this point, specifically with how Hartline fits in with the rest of the receivers. "As of right now, I like the way it is shaping up. I really do. I think we have added a little more speed to our group right now," said Sparano, who hasn't ruled out keeping as many as six receivers on the roster. "When you look at (Anthony) Armstrong, Teddy (Ginn, Jr.), Hartline; these guys from a speed standpoint out there and the way they run (is a plus). We have added a little more size to the group certainly. Hartline is a big guy; Turner is certainly a big guy out there, Brandon London, so we have some size and athleticism. "I think a couple guys will be interesting competition and might perform the same jobs as we get on in this thing. You have guys like (Davone) Bess, Camarillo, and Hartline, all guys that can play in the slot and do some of those type things as inside receivers, so it will be interesting to watch how the whole thing shakes down. I like the way the group complements each other and however many guys we keep at that position, we will be able find a role for each one of them at the game." Another role Hartline is comfortable playing is on special teams as a gunner. He has been quoted boasting how he "likes to crack heads," and as a redshirt freshman with the Buckeyes he delivered the Jack Tatum hit of the week against Indiana while on special teams. Sparano and his staff place a lot of emphasis on being able to excel on special teams and will consider a player's prowess on that unit when making the decision on who to play and who not to play. So far Hartline has said and done all the right things in the eyes of the coaches and his new teammates, and he harkens back to some of the important lessons he learned from his different high school coaches, specifically his hurdles coach at Glen Oak, Chad Palmer. Every coach he has played for has left an imprint on Hartline's development and he is looking forward to gleaning as much as he can from Sparano and Dorrell, as well as offensive coordinator Dan Henning and the other coaches. "Every trait that Coach Sparano has is a trait that I like to see in a coach," said Hartline, who finished his college career with 90 catches for 1,429 yards and 12 touchdowns and earned the Paul Warfield award as the school's outstanding receiver as a sophomore. "He's very meticulous. He knows what he wants and he and Chad Pennington really kind of mirror each other sometimes and I think they have a great correlation that again rubs off on everyone else. He has high expectations, loves competition and again that kind of facilitates the rest of the team." Hartline's goals and expectations headed into training camp are to continue to improve as a receiver and to show enough to Sparano and the others form a versatility standpoint to warrant a spot on the final 53-man roster. At least if that happens he'll be able to hold up his end of the bargain when the war of words about the Ohio State-Michigan game commence. Oklahoma Coach Bob Stoops speaks during a press conference last January. OU Regents announced Stoops will make almost $5 million in 2011. 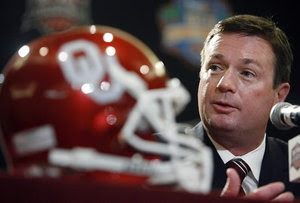 ARDMORE -- Bob Stoops will make nearly $5 million as Oklahoma football coach in 2011, should he remain that long, according to his revised contract approved Wednesday by the OU Board of Regents at their annually scheduled meeting in Ardmore. The regents also approved raises for OU basketball coaches Jeff Capel — his guaranteed salary increases from $1.05 to $1.5 million — and Sherri Coale, as well as baseball coach Sunny Golloway and softball coach Patty Gasso. Members of Capel’s, Coale’s and Stoops’ staffs were given raises as well. Stoops’ reworked deal, which was extended two years through Dec. 31, 2015, allows for a current guaranteed $2.975 million. It also calls for a $700,000 annual stay bonus, first payable Oct. 1. Meaning, when Stoops takes the sideline for the next OU-Texas game, he’ll be making $3.675 million. An additional bonus, termed in the contract an “Additional Stay Benefit,” of $800,000 will be paid following Jan. 1, 2011. Factoring in the $700,000 bonus already in place, as well as the automatic $200,000 annual private-funds bump also built into the contract, Stoops stands to make $4.875 million in 2011. And that’s before performance-based bonuses also included in the deal. Should the Sooners compete for the Big 12 championship and a BCS bowl that season, as is typical under the coach, Stoops would clear the $5 million mark. All told, his seven-year pact is worth $30.125 million. Capel, who last season coached the OU men to 30 victories and their first Elite Eight appearance since 2003, had his contract extended two years through June 30, 2016. As with Stoops’ contract, there are annual bumps built in — $50,000 through the 2011-12 season, then $70,000 through 2013-14 and $80,000 through 2015-16 — and two tiers of bonus money allowed. Capel receives a stay bonus of $1.1 million following June 30, 2014, and what is termed a “supplemental” stay bonus of $400,000 following June 30, 2016. Should he remain OU coach through the 13-14 season, Capel is in line to receive $2.84 million. As it stands, his current guarantee of $1.5 million makes him the third-highest paid coach in the Big 12 Conference, behind Kansas’ Bill Self and Texas’ Rick Barnes, whereas before he ranked sixth. It also symbolizes what Castiglione hopes is a preemptive strike against programs who have shown interest in the 34-year-old coach after OU’s past two seasons. Coale, who steered the OU women to their first Final Four since 2002 last season, closed in on the $1 million mark Wednesday. Regents approved a $60,000 guaranteed income hike to $900,000, with performance-based bonuses built in as well. Coale’s contract continues through July 1, 2017. Golloway, whose Sooners bounced back from two straight shaky seasons to win 44 games and host an NCAA regional last year, was given a three-year extension through the 2013 season. He’ll make a guaranteed $201,000 under terms of the new deal. Among OU staffs. Capel assistants Mark Cline, Oronde Taliaferro and Ben Betts all received $12,000 raises in guaranteed income. But the raises issued Stoops’ assistants varied. Offensive coordinator Kevin Wilson was given the highest bump, $100,000, to a guaranteed $385,000. Defensive coordinator Brent Venables was next at $50,000, to $395,000. Quarterbacks coach Josh Heupel, perhaps cashing in on the success of Heisman Trophy winner Sam Bradford, received a $44,000 raise, to $200,000. Other staff raises ranged from $25,000 (Jay Norvell) to $15,000 (Cale Gundy, Jackie Shipp and James Patton) to $10,000 (Bobby Jack Wright and Chris Wilson). In other action, the regents bumped Gasso’s salary to $133,000 and approved contracts for new coaches Ryan Hybl (men’s golf, $100,000) and John Roddick (men’s tennis, $99,800). 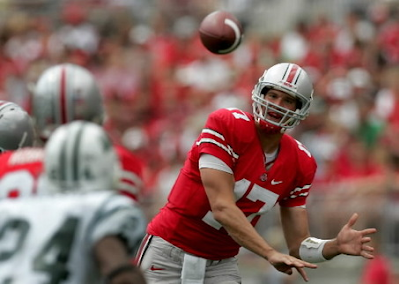 Former Buckeye quarterback Todd Boeckman, who was an All-Big Ten pick in 2007 before losing his job to Terrelle Pryor during last season, is getting a shot in the NFL. He has signed as a free agent with the Jacksonville Jaguars, according to his Beachwood-based agent, Neil Cornrich. Boeckman earlier had a tryout with Cincinnati but didn’t sign with the Bengals. Jacksonville previously signed former Buckeye defensive tackle Nader Abdallah in May after he also went undrafted, but the Jaguars waived Abdallah two weeks ago. It certainly seems possible to me that Boeckman could hook on as a third quarterback. He has the size, the head and the attitude to handle himself in the NFL. According to Neil Cornrich and NC Sports, LLC, former Ohio State quarterback Todd Boeckman has agreed to terms on a contract with the Jacksonville Jaguars. Contract specifics were not released. Boeckman, a St. Henry High School graduate, was named to the 2007 All-Big Ten team and was a team captain for the Buckeyes this past season. He started 17 games during his career at Ohio State. Only one high school in Ohio State history has produced two starting quarterbacks for the Buckeyes – St. Henry. 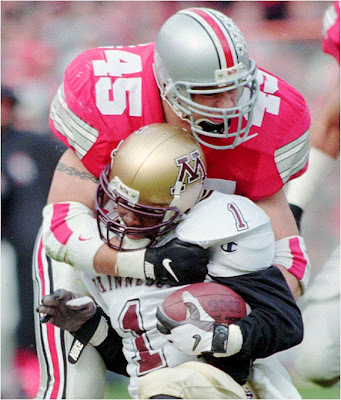 Former St. Henry grad Bobby Hoying, a member of the OSU Hall of Fame, played QB for the Buckeyes from 1993-95. He too was All-Big Ten. Hoying played in the NFL for Oakland and Philadelphia. • Stoops is 109-24 overall, 72-14 vs. the Big 12, 39-10 vs. the Big 12 South, 31-4 vs. the Big 12 North, 6-1 in the Big 12 title game, 37-10 vs. non-conference opponents, 60-2 at home, 31-11 on the road, 16-11 on neutral fields, 33-12 vs. ranked opponents, 4-6 in bowls, 3-5 in January bowls and 2-5 in BCS games. • OU has set or tied more than 180 school records under Stoops, not including bowl bests and marks specific to a particular position (i.e., receptions by a running back). Among those marks under Stoops are passing for a game, season and career; receiving for a game, season and career; and rushing for a season. • Stoops has authored two of the seven longest winning streaks in Oklahoma history. His 2000 and 2001 teams won 20 straight, while the 2002 and 2003 teams reeled off 14 in a row. Those victories all came against I-A opponents. • Oklahoma owns the nation’s longest home field winning streak at 24. That’s the second longest streak in school history just one behind a 25-in-a-row string that ended in 1953. Stoops also has fashioned two other streaks of 19 straight. • OU won the 2000 national championship, played for two more and captured six Big 12 South crowns and six Big 12 titles. Oklahoma has spent 24 weeks at No. 1. • OU has held a double-digit lead in 112 of Stoops’ 133 games. • Oklahoma has played in 10 bowl games. Never had an OU coach taken even his first three teams to bowls. Prior to Stoops’ arrival, OU had not played in one of what is now a BCS game since the 1988 Orange Bowl (1987 season). 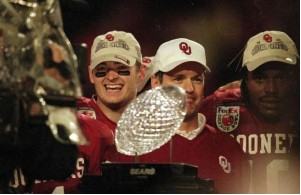 Stoops, in his second season, led OU to the 2001 Orange Bowl (2000 season). • An OU player has finished among the top seven in the Heisman voting six times on Stoops’ watch: Sam Bradford (No. 1 in 2008), Adrian Peterson (No. 2 in 2004), Jason White (No. 3 in 2004), Jason White (No. 1 in 2003), Roy Williams (No. 7 in 2001) and Josh Heupel (No. 2 in 2000). • Under Stoops, OU has produced 29 All-Americans; two AP Players of the Year (Heupel, White); two Nagurski Award winners (Williams, Derrick Strait); two Thorpe Award winners (Williams, Strait); two Butkus Award winners (Rocky Calmus, Teddy Lehman); one Bednarik Award winner (Lehman); one Lombardi Award winner (Tommie Harris); one Walter Camp winner (Heupel); three O’Brien Award winners (Sam Bradford and White twice); a Maxwell Award winner (White); a Unitas Award winner (White); an Outland Trophy winner (Jammal Brown) and one Mosi Tatupu Award winner (J.T. Thatcher). • OU has had a Butkus finalist in four of the last eight years and a Lombardi finalist in three of the last six. The Sooners also have had finalists for the Biletnikoff, Groza, Guy, Hendricks, Mackey and Doak Walker awards. • In 1996 and 1997, his Florida defense scored eight touchdowns. The 1996 Gators won the national championship. • During his final four seasons in Manhattan, Kansas State posted a 35-12 record and played in three bowl games.